It just doesn’t occur to people to make some things at home. English muffins are one of those things. But you should! They aren’t that hard, and unlike chocolate chip cookies, whom everyone in the world feels empowered to make at home, they are quite unusual which will make you feel Bad-A when you serve them up at brunch. These english muffins are don’t have any commercial yeast, instead they are leavened with my sourdough starter. They have a wonderful mild sourness, but are totally suitable to being eaten with a little jam or honey. They really are superior to Thomas’. My nooks and crannies are all natural. And wild. This recipe is based on Peter Reinhart’s excellent from “Artisan Breads Every Day”, but adapted to use my sourdough starter instead of commercial yeast. The recipe has a few strange twists. For instance, adding baking soda to the batter after it has risen over night. The purpose of the baking soda is to give it a bit of extra lift, contributes to the characteristic pockets and crannies of a good english muffin, and to raise the pH of the batter, which enhances browning. The muffins are also cooked in a pan, not in the oven! Soft and Wet. Just like the MC Hammer Lyric. Just pop them out of the rings, and you have what they call an “English Muffin”, but I doubt the English deserve any credit at all. Damn imperialists. Combine wet ingredients, plus starter. Combine dry ingredients. Combine wet and dry ingredients and mix vigorously for 2 minutes to develop glutens. Let sit on counter for 2-3 hours to let the fermentation get going, then refrigerate overnight. If it’s winter, or cool in your house, you may want to leave it out all night. The next day, remove the batter from the refrigerator 2-3 hours before cooking to allow it to warm up. Dissolve baking soda in 3 Tbsp warm water, then gently fold into the batter. Do not over mix. While batter rests for 10 minutes preheat griddle (or cast iron pan) to 300º, just shy of smoking. Meanwhile, prepare rings by spraying or wiping with oil, then dusting them with cornmeal. Arrange the rings on the griddle, then dust the pan inside of each ring with cornmeal. Using an oiled measuring cup, pour roughly 1/3 cup batter into each ring. You want the rings roughly 2/3 full. Sprinkle the tops of each muffin with a light dusting of cornmeal. Turn down the heat slightly, you want it no hotter than 300º, and if in doubt, lower is better than higher. Cook the muffins for about 12 minutes, until the bottom is golden brown and the tops no longer look wet. Flip, then cook for about another 12 minutes. If it looks like your muffins will be too dark in 12 minutes of cooking, your griddle is too hot. When both sides are a nice golden brown, and the muffin is springy, not yielding to the touch, remove from the heat. When cool enough to handle, pop them out of the rings, and let cool completely . Split with a fork to enhance the nooks and crannies. Eat Me! You may or may not deserve me, but I taste so good. This was written by cedar. Posted on Thursday, May 9, 2013, at 10:01 pm. Filed under Recipes. Tagged baking, breakfast, fermented, grains. Bookmark the permalink. Follow comments here with the RSS feed. Post a comment or leave a trackback. These look delicious! 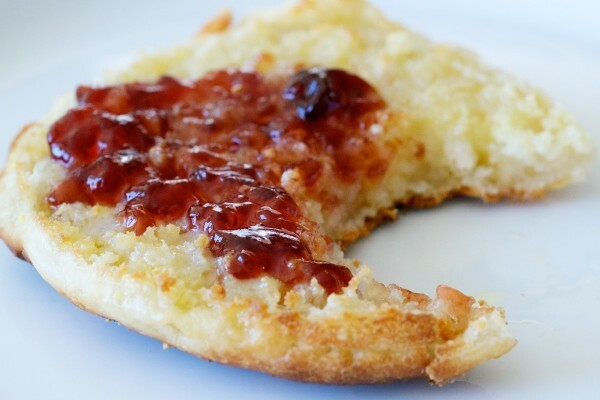 I have so much starter and have wanted to try my own English muffins for a long time…I am growing tired of always making sourdough bread and rolls…Can’t wait to try this recipe and the muffins especially with homemade strawberry jam once they are done! Wow! My first successful English muffins! Thank you for the recipe and especially the photos that give me a clue about the batter/dough consistency! Pictures looked great. My product – hard, didn’t rise – went out to the birds. I’m back to my old English muffin recipe with yeast and 1/2 cup sourdough which came out wonderful. Sorry to hear that! I’ve had several reports of people having good success, so I think the recipe is sound. Perhaps your starter wasn’t vigorous enough? Good luck! Great muffins! Jar lids made them too small; so we just got some muffin rings. Thanks! I’ve got a batch on the counter for the over it rise. Wish me luck! These are the best english muffins I’ve ever made! I followed the recipe exactly as written with perfect results. Thanks for such an awesome recipe! I have over filled my rings and given them a “rustic” style! HAHA They smell divine and I took your advice of leaving the dough out all night since we are in winter storm warning! IT ROSE BEAUTIFULLY! Thanks so much! Delicious muffins with lots of crannies! I love that you don’t add extra yeast – there’s no need if you have a healthy starter. One change that I made, though: I didn’t want to use the canning rings because I didn’t want to scrub them all afterward and I’m a bit squeamish about using those colored tin things for cooking, so I baked them like muffins (20 minutes at 400 degrees). Didn’t look like English muffins but the taste and texture – perfect! delicious, but mine also didn’t rise – I thought that was ok because I learned a lot about my starter. Anyway, my family is still eating them…. I am working on creating a more “vigorous” starter and will try again next weekend. I’m new to sourdough baking/cooking. So I thought I was going to screw this up a few times till I mastered it, but they came out beautiful AND delicious! Thank you for the easy instructions and pictures. I will definitely be making these again and again! delicious! I made them and they came out just fine. Success! I used my sourdough starter, and it tasted GREAT. Round cookie cutters worked great for me. Thanks for sharing. Being a baker with over 30 years experience, I found your recipe intriguing since typically, english muffins are rolled out and cut and then cooked on the griddle. Crumpets are cooked from a batter. 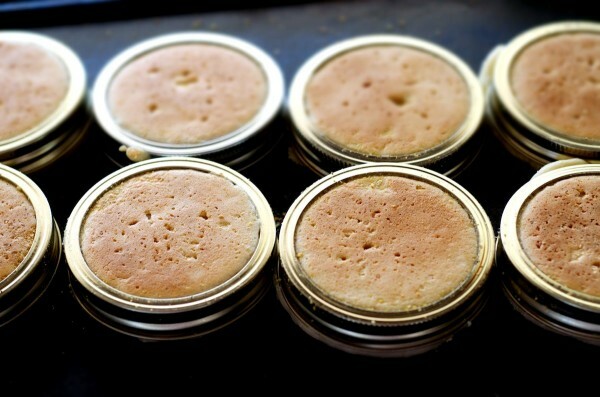 So I made these up out of curiosity and I have to be totally honest with you…..they are crumpets in taste and texture. They do not have the density of an english muffin. And…..after the first batch, the baking soda in the batter starts to lose some of its chemical reaction and consecutive batches lose some of its rise. All in all, it was an interesting trial in trying a new method, but as I said, the taste and texture says, “crumpet”, not english muffin. All you need to do to turn this recipe into crumpets would be to flip them over after cooking on the one side and then lightly cook the second side for 2 to 3 minutes. I’ve made these enough times at this point to do it by heart. They are SO good, and I get rave reviews every time I make them. I find that the batter has a variable consistency–can’t explain it, perhaps the weather? ?–but even so they’re always delicious. For the record, I disagree with the previous commenter about the crumpetness. I find these denser and breadier than crumpets; they are just slightly sour, incredibly tasty English muffins. Worth the (considerable) effort, and they freeze really well, so you can make a big batch and save them. Liesel, glad you gave the recipe a shot, but I think something went awry with yours. They are indeed supposed to be cooked on both sides, as the recipe states. Mine turn out like pretty classic english muffins, not crumpets. Always looking for sourdough recipe’s to add to the collection and this is a keeper.Found it very easy to follow. I left it on the counter four around 4 hours and it had started a good rise when I put it in the fridge. Baked them off this morning and they came out wonderful. Used bigger muffin rings so had 8 good size muffins that were about 1 inch thick. YUM YUM YUM !!!!! Looking to try these this weekend – If you think your starter may not be vigorous enough wouldn’t just adding a pinch or 2 of dry yease help overcome that issue ? Sorry – Dry Yeast that is . Adding some instant yeast would likely work, but I haven’t tested it. Good luck! These came out very good – The little yeast gave them a sure thing rise, even though I believe my starter was hearty. Mybe becasue of the touch of yeast, I’d use 1/4 cup of the dough in each ring because a third puffed up a bit over the rim. I have photos but I see there is no-where to post them to your comments. Thanks for the recipe from Peter and the great idea of the canning lids to keep their shape ! Glad you like them! I did adapt these from Peter’s recipe, but his only used commercial yeast. I adapted it to use sourdough. Perfect! My only problem was in getting all of them neatly out of the canning rings. Guess I will just have to eat the raggedy ones before anyone sees them. I will definitely make these regularly – the taste and crumb were terrific. Glad they tasted good! Maybe they will come out more easily if you are more generous with the oil and cornmeal on the rings. These are crazy easy and beat the pants off of store bought. I’ve been making these muffins every weekend for more than a year now. This recipe is the real deal, every bit as good as advertised (and maybe better!). Maintaining a good starter is the key to making this work. I tried other recipes before this one and they were okay, but this was the one that made me go “wow!” I’ll never go back to any other muffin after this one! Rianne, there is only one way to find out! Give it a try and see what happens. I made these for the first time this morning. I followed the directions for the batter, I made it yesterday and just let it set on the counter overnight because it’s cool in our house. The only thing I did different was the actual cooking method. I have a Viking 6 burner cook~top and while it’s great for grilling pancakes because they are thinner, even with the gas on low, I was afraid that these would cook to fast and not be done on the inside. So, I heated my oven, pizza stone (sprinkled with cornmeal) and set the greased English Muffin (3-3/4″ across and 1-1/4 tall) rings on the Pizza Stone & pre-heated it all to 350 degrees. When the oven was fully pre-heated, I added the baking soda mixed with water until it was fully incorporated. Then using a 1/2 cup scoop (because my EM rings were bigger than canning jar lids) I scooped a heaping1/2 cup batter into each ring and baked 12 minutes. Then I turned the muffins and baked for another 15 minutes. The came out PERFECT! I got exactly 8 muffins. So YES you can bake them! Thank you for the recipe, it will be one I use many times. I believe you meant Prince not MC Hammer (Soft and wet). You may not know your 80’s hit makers but your English muffins have enlightened our baking endeavors. Thanks! I apologize for my correction. MC Hammer did have a soft and wet lyric , but MC Hammer ripped off Prince. This is the best English Muffin recipe I have ever tried and the taste is out of this world. thank you thank you!!!! Oh, I’m so excited to find this recipe and the one for waffles! After going to all the trouble of nurturing my own wild yeast starter I feel slightly insulted that so many sourdough recipes call for adding commercial yeast as well. Lol. I’m going to try these tonight! This is a great recipe. I just did it today. I found my griddle cooks a little hot. I made a few slight mistakes that effected the end product. With all that said it was awesome! I realize my starter is still just a young one and so I look forward to doing this again. This is my second time ever working with wild yeast and mhy second batch of English Muffins. This recipe is a keeper. The mason jar rings were perfect. Loved it so much. Thanks for doing it. I’m a newie to the sourdough baking scene, but am thoroughly enjoying it. I’ve got the dough resting on the counter and it will be ready in the morning for me to give these a try. I love English muffins, but have never attempted making them! Can’t wait to give these a go, with such raving reviews they are sure to be a winner! I just made these…I have a really good, SOUR starter, and it raised really nicely on the counter over night. I also didn’t get the rise I was looking for in the ring,, but I did use English muffin rings, and filling 2/3s full they didn’t raise to the top of the ring and I actually had to loosen them and push them down onto the griddle. I think next time I may add a touch of yeast also. And at 2/3 full made 9 muffins. They do smell and look good, just not as high as I thought. And they do look more like crumpets. Definitely a crumpet, but I’ve always wanted to try one of those! Turned out fine. Thinner than an English muffin when split. Mine fell a little as they cooled, but nooks when split. Thanks for sharing! Such a great recipe! I have to cook mine a little longer, maybe I”m turning my griddle too low. They are really delicious though & the texture is perfect! Just made these don’t know why other people had trouble with them rising! I had to put less dough in my muffin rings because they rose over the top of my rings . Really easy to make too! Enter your email address to subscribe to this blog and receive notifications of new posts by email. I will never share or sell your email address.